D start above hash mark, F start in 4 lines on the blue lines. Drill starts at both ends at the same time. At the whistle, D picks up puck and skates low around the net. Two forwards skate down low at the same time. X1 acts as winger and skates low, transitions (eye on the puck). X2 acts as center and swings low through the D zone. D makes break out pass to X1, X1 and X2 continue break out towards other end. 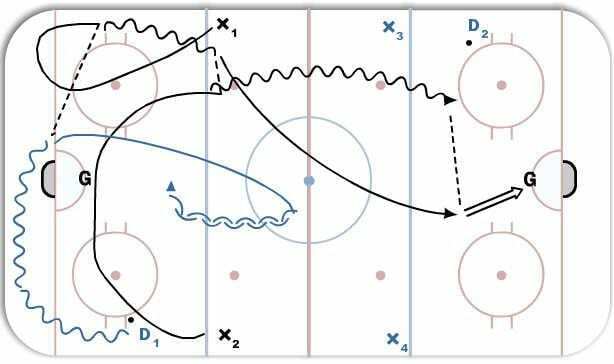 D continues to skate towards the red line, transitions, and plays 2 on 1 with X3 and X4.